In this era of technology where hordes of digital marketing agencies breathe, it becomes quite challenging to find that one agency that can cater to your needs consummately. Under so much competition, every agency tries to sell themselves as dependable, trustworthy and sincere but how we really differentiate? Digital marketing solely rests on the fundamental principle of focusing on the target market and making apt content for them. While almost all the agencies follow traditional technique to achieve this CRUX takes a distinctive approach. And this is the pinnacle where CRUX marks its exclusivity and emerges as one of the best online marketing company in India. While most agencies are fast, we are agile. An agency offering digital marketing services should be fast. It should be able to meet deadlines, work under pressure, quality and timely deliverables and be ready ahead of time. Most of the agencies promise to be fast and often results are affirmative. But, CRUX is not just fast but agile. We not only lay stress on deliverables but our emphasis also lies on being adaptive. We quickly adapt to client's needs, to their changing plans and business strategies. Further, we swiftly adapt to changing trends in the digital marketing and making our clientele also aware of it. As a practice, most of the agencies extend great expectations and affirm to every need of the client. They gloat over their capabilities and take more than necessary responsibilities. But such a practice, in the long run, proves catastrophic for both the parties. As a responsible digital marketing agency, steady in Gurgaon and Delhi NCR, we remain clear and specific about our credentials. We take charge of the work only when we are super definite about our expertise in it. Further, we clarify individual responsibilities at primary stage only, so as to avoid any ambiguity and later on. Where every online marketing company in India is focusing only on advertising, we focus on brand building. As a desperate step to stay relevant and in-business, most of the agencies blindly aim at advertising. An effort that eventually becomes a maneuver to coerce people into buying the clients product. However, digital marketing is a lot more than that. We at CRUX, concentrate on inbound marketing. We have materialized as a successful creative digital marketing company because we focus on building brand awareness, a reputation or image to which the audience can connect and be attracted to. We use marketing assets into creating relevant content that brings value and pulls prospects to the brand. No campaign abuse instead judicious and comprehensive strategies. Campaigns have become a plain-sailing and cajoling technique for digital marketing for every agency. As a marketing hack, they have been immensely overused. However, while campaigns are a completely sensible and valuable part of marketing, they are just a short-term maneuver for quick traffic hit. CRUX, as one of the well-known online marketing agency in Delhi NCR, understands that campaigns one after the other can make the whole marketing strategy a slapdash. Instead, we emphasize on broad and long-term goals. We indulge in wide stratagems to achieve bigger marketing goals and campaigns are just a part of this scheme. We are a 360 online marketing agency in Gurgaon and Delhi NCR and we take pride in offering the best digital marketing services in this area. 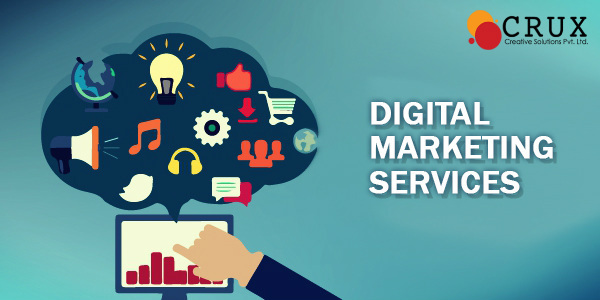 We are constantly ranked among the top online marketing company Delhi NCR and Gurgaon because we understand the world of web and mobile technology as our home and understand the importance of digitalization in the future world.